The SIM card we received with the phone we got did not work so I had to go to an AT&T store in the morning today. Since I didn’t get the phone set up until later this morning, I did not officially start the challenge until 12PM. I had about an hour to let people know my temporary number for the next week. This wasn’t that hard though since I decided it was only necessary for me to tell a few people about this change. Everyone else who randomly decides to reach out to me in the next seven days will just have to wait. Sorry! At noon on the dot, I had to hand in my smartphone. It was immediately turned off and put into a drawer. The next time I was going to be seeing it will be the end of next week. I was going to go pick up the printer after work but I decided that I could just write down any type of travel instructions for the next week.If I borrow the printer, not only do I have to bring it home, but I will also have to bring it back. Lugging around a printer on the subway during rush hour — TWICE — does not seem fun at all. I’ll pass. I had previously made plans to go to dinner with some of my friends. I looked up the restaurant before leaving and decided it wasn’t necessary for me to write down instructions. Right before I was about to head out, one of my friends texted me saying they were all grabbing a drink before dinner. Unfortunately, they didn’t let me know until it was too late.When I asked them why they didn’t tell me about the pre-dinner plans earlier, they said they honestly forgot since it was decided in the group chat. (Note: the dumb phone does not do group messaging.) Was I feeling any sort of FOMO? No, not at all.Just a little annoyed they forgot and only a few hours ago, I told them my new number for the week. It’s all good. Dinner was extremely delicious and enjoyable. I forgot to charge my phone last night but the phone battery indicator was still three-quarters full when I got up this morning. Perks of having a dumb phone — the battery life lasts forever. I had made tentative plans but had to text my friend to finalize what we were doing. I really wished I had my smartphone at that moment because texting on a dumb phone with the alphanumeric keypad was painfully slow.As someone who likes to be as grammatically correct as possible on text, I couldn’t get myself to abbreviate or forego commas and periods. Once we finalized our plans, I confirmed the cross streets for the beer hall we agreed to meet at before heading out. After having a beer and catching up, we went to the Takashi Murakami exhibit in Lower Manhattan. We tried taking the subway but there was a lot of construction work being done on the required line so we decided to take a cab halfway. While in the cab, I noticed my phone was missing from my purse. I emptied all the contents of my bag and frantically searched for it. No luck. I had a mini panic attack because I had no idea how I was going to tell my team I lost the phone a day into the challenge.My friend calls it and we find it behind him on his side of the seat. The phone is so small and light that when I got into the cab, it must have bounced out of my purse. Thank goodness it hadn’t tumbled out of the cab. En route, my friend agrees that he’d take all the photos for us but I want to compare my picture quality with his. (1.3 MP camera — that’s what I’m talking about!) I walk around and decide to get a new background photo. *click* To both his and my surprise, the phone emanated an obnoxiously loud *snapshot* sound. He got slightly embarrassed but I told him I didn’t know how to turn off the sound effect. The phone was already in silent mode. I later found out that you have to manually turn off sound effects via the camera’s settings. As a cute side note, there are two other sound effects besides the “snapshot” tone. Option two is: “Ready? One, two, three!” and option three is: “Say cheese!” I personally love the “snapshot” sound because it’s classic and nostalgic, but I do admit it’s a bit too obnoxious for everyday use. I didn’t have any plans other than to run a couple of weekend errands. I usually would lay in bed and catch up on emails, the news, and check out my Facebook newsfeed on my smartphone. (Yes, I am guilty of using my phone in bed.) However, since I only have my dumb phone, I was forced to get out of bed and start my day. My apartment building does not have a built-in intercom system where we can buzz people in. Instead, when visitors or in this case, the delivery man, buzzes the apartment, the software calls my phone. My phone then becomes the intercom system; I am able to speak to the visitor and also unlock the front lobby door by dialing a code on my keypad. Since I don’t have my smartphone, I wasn’t able to buzz the delivery man up when he arrived.I added in the delivery notes section my temporary number but I never received a call. Miraculously, he got through the lobby doors. On Sunday nights, I typically like to peek at my in-phone calendar for an overview of the upcoming week. Since I didn’t have my smartphone, I had to individually check my work and personal calendars on my laptop. Not that big of a deal but just something I had to do differently due to the challenge. In the office, my team asked me if I feel any different and if the weekend was rough with my dumb phone. I’ll be honest, there were a few moments where I went, “Ughhh, I really wish I had a smartphone right now!”but it wasn’t as tough as I had initially thought it was going to be. I think part of it is because I have most of my schedule laid out and I was occupied most of the weekend. Whether I was out with my friends or laying on the couch and catching up on all of my TV shows, I didn’t find myself reaching for my phone all that often. Since it can just text and call and only a few people have access to this number, I didn’t feel the constant need to check if I missed any new notifications. After work, I had plans to meet up with an ex-colleague I haven’t seen in a while. I looked up the directions in the office but didn’t need to write down instructions since they were simple enough. I was also somewhat familiar with the neighborhood where the restaurant was located so that was a plus. There were two routes I could have taken to get to the restaurant. Both routes would have taken about the same amount of time but one was direct while the other required me to transfer once. With my smartphone, I would typically check the MTA app on my way out to see which train schedule would make the most sense. The direct train line only comes about every ten minutes so if I knew I was going to just miss it by the time I got to the station, I would have opted in for the other route. Since I forgot to do that while still in the office, I took the risk. Unfortunately, the train closed its doors right when I got to the turnstile. It was great catching up with my ex-colleague and to my surprise, he mentioned that he spent six months without a phone to see if he could do it.He said he used an iPod Touch and connected to WiFi whenever he needed to contact someone. As for calls, he used a Google Voice number. From his six month stint, he said his friends and family learned to be more reliable and that people were more likely to follow through with plans (unlike mine on day 1). During my ride home, I started to really miss my smartphone because I wish I could have listened to music.Like most people nowadays, I no longer own a separate device such as an iPod (or Zune) to listen to music. Without my smartphone, I had no portable access to music or even podcasts. I purposely put a book in my backpack this morning but after a long day–and a few drinks–winding down during my train ride home with some music sounded so much more appealing. I am about half way done with the challenge and so far, things haven’t been as challenging as I originally assumed. Yes, there have been a few inconveniences but nothing major. I thought I would have at least gotten a few strange looks or inquiries about my dumb phone but nothing. Tonight, I went to a trivia night with a few former colleagues-turned-friends of mine. We’ve had this trivia team going for about a year now, but tonight is most likely our last game since an integral member of the team is moving to Austin in the next two weeks. I arrived a little late so I ended up putting all of my drinks on someone else’s tab. At the end of the night, I forgot I didn’t have access to Venmoso I felt bad I had to get my friend to charge me. However, from my past experiences, he either never charges or undercharges. I don’t typically carry around that much cash so I couldn’t pay him back that way either. I hate the feeling of owing someone money so I made a mental note to Venmo him on Friday. In the evening, a colleague and I went down to check out a sponsored liquor tasting from a fledgling liquor company. The founder and owner was there to tell his story and explain the nuances of each spirit he brought to the tasting tonight. He eventually asked what it is that we do and when we told him, he instantly understood the mission of BOLDFISH. The guy told us that he intentionally made the decision to keep off social media, both personally and for his company. He said that he truly believes social media makes people feel sad and an array of other negative feelings. People may not know it quite yet, but if they were to get away from social media, he thinks people will slowly start to realize how bad it is for them. 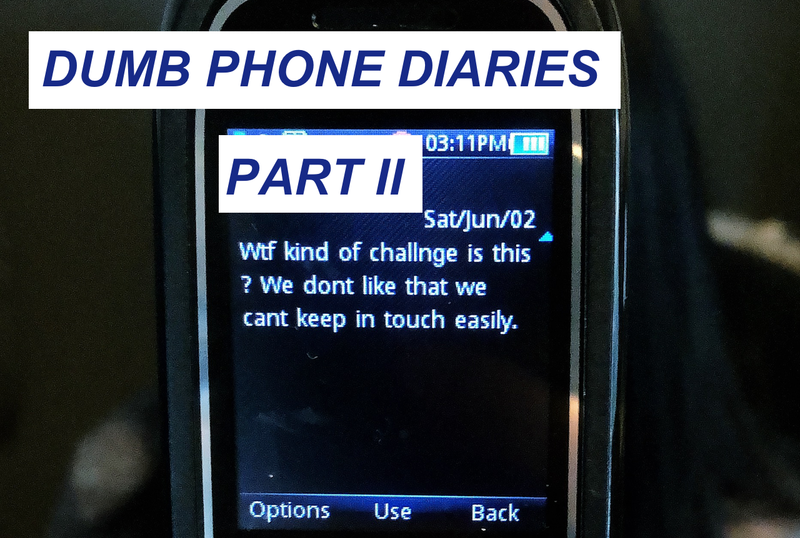 He loved the idea of our dumb phone challenge and even mentioned how he went without a phone or laptop for a whole year. He said during that year, he had never felt more present in his life. Something that hit me today was that while I’ve been doing this dumb phone challenge, I’ve naturally also done somewhat of a social media detox. In the past couple of days, I only logged onto social media once and that was because a friend has reached out to me via Facebook Messenger right before I handed in my smartphone. I felt obligated to respond before I completely forget about his message by the end of the week. Even with my smartphone, I still think I go on social media a lot less than most of my peers. I think that because I am constantly looking to my smartphone to keep me preoccupied or busy, I naturally go onto Facebook as something to do. I don’t necessarily feel the urge to go on but it’s something that’s purely convenient and easy for me to look at to pass the time. Tonight, I had dinner plans with a friend I haven’t seen in a few weeks. The restaurant he picked was in an area I don’t frequent all that often. While I was still in the office, I had to print out two sets of directions. One on how to get there from the office and another on how to get home from the restaurant. I almost forgot to print the directions on how to get home because I’m so used to pulling up Google Maps before leaving a place to get directions. My friend told me he was very impressed with the speed and accuracy of my texting. What can I say? I’ve had days of practice. During the day, I usually kept the flip phone on the “silent” sound profile. However, when the phone is on silent mode, alarms will not sound or even vibrate.Last night, I forgot to switch the phone’s sound profile so my alarms this morning basically did nothing to help me wake up. Thankfully, I woke up naturally around the time I had set the alarms. Using a dumb phone for the past week was not as big of a deal as I had originally thought. While I did have to make some lifestyle adjustments and get used to some of the inconveniences that come with not having a smartphone, it overall was not bad. It’s been only a few hours, but I’ve received empty texts that presumably were supposed to contain emojis, which in some ways reflect what a smartphone delivers to its user: bite-sized packets of emotive emptiness. My withdrawal symptoms have clearly heightened my flare for the dramatic. I cannot read the news, answer emails, or enjoy novels without the bottleneck of a single-serving object: newspaper; computer; book. Admittedly, I am more addicted to my phone than my partner, but unlike her, I do not have social media. Clearly, social media addiction is only a piece-meal draw of the smartphone. My partners wonder how I will survive, but I’ve never had a problem with change–as my life for the next seven days will inevitably have to. I take solace in knowing that at one point or another, all three of us will have gone through this challenge. However, for the time being, I can’t help but think:how I miss my phone.